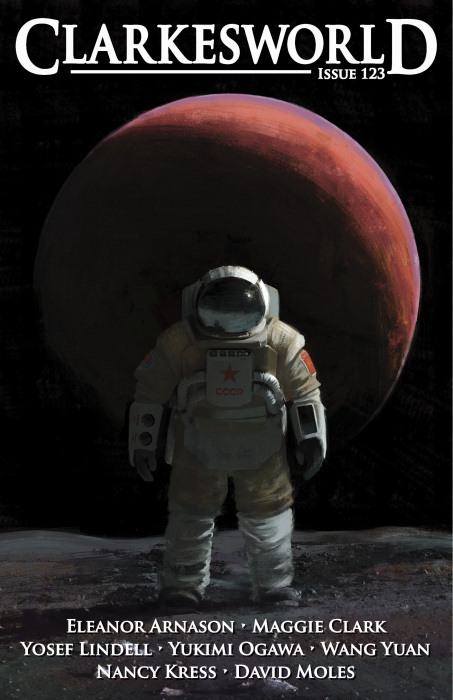 "Painter of Stars," by Wang Yuan (translated by Andy Dudak, edited by Neil Clarke), appeared in Clarkesworld issue 123, published on December 1, 2016. Pro: A robot acquires sentience and sets out to change the world. It find success unsatisfying, and, helpless in the face of the plague, finds failure unsatisfying too. In the end, it finds that happiness lies in caring for those you love. Con: The writing is pretty bad, most of which cannot be blamed on the translator. There's almost no character development or dialogue; the story is told almost entirely through narration. It defines disbelief in countless ways. For example, a robot isn't going to stop global war just by tattooing a few people here and there. Random strangers in foreign countries already know all about him, but his old mistress doesn't recognize him at all. The science is very bad as well. The Earth is not moving further from the sun, and computers do not process information anywhere near the Planck limit.